Argentina is on the brink. The vicious austerity plan that President Macri’s government is trying to implement (and succeeding, to some degree) has increased Argentina’s poverty rate to 27 percent and its unemployment to close to 10 percent. It is estimated that while inflation is going to be just shy of 50 percent this year, salaries have only gone up 15 to 25 percent. This is a massive blow to working people’s living standards which Macri has only been able to implement due to the support from all the bourgeois parties, including the Peronists (including Pink Tide Kirchnerism in all its variants). 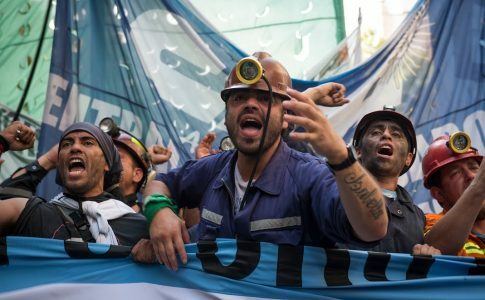 In many cases, the working class is resisting the layoffs and attempts to close factories, such as the Rio Santiago shipyard or the Rio Turbio coal mine in the Patagonia. Teachers and students have come together to resist budget cuts to public universities and schools. 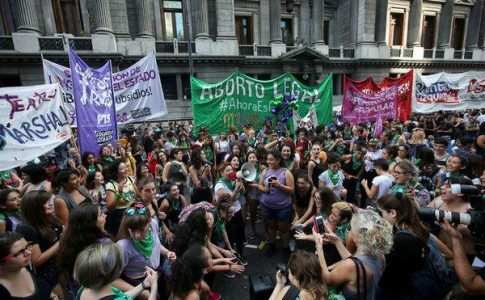 This has forced the union bureaucracy to issue a tepid call for a national strike The women’s movement mobilized massive protests although a proposed law legalizing abortion was rejected in the reactionary-dominated Senate on June 13. 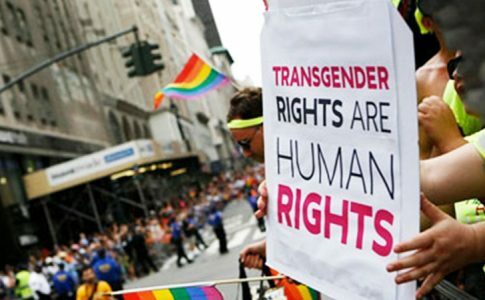 The movement continues to grow, and the advances it has made are going to be very difficult to roll back. At the same time, if all these struggles continue to be disorganized, they are in danger of being crushed one by one. This is why we need a party that can bring together the most advanced workers and oppressed people—those who are most determined to fight and organize beyond their individual struggle. This party must fuse the vanguard with the broader left and be a real match for the bourgeoisie and their attacks. In this spirit, the PTS called a nationwide rally on October 6 and put forward a call to form a unified socialist party of the workers and the left, based on the agreements and the program of the FIT (the Workers and Left Front). 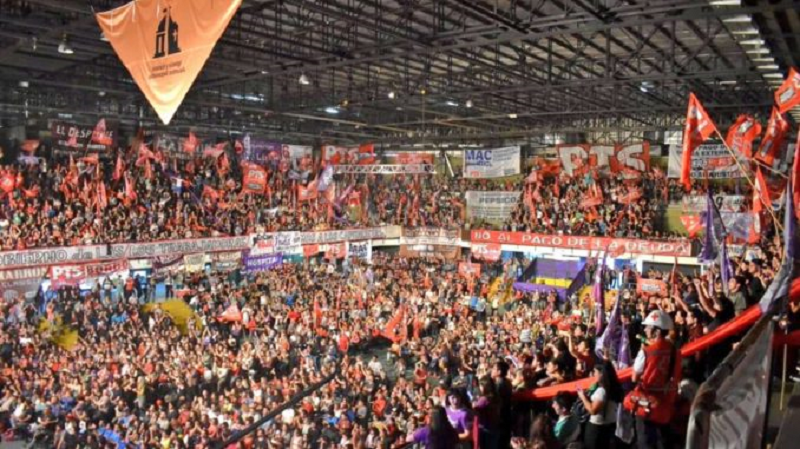 The rally was held simultaneously in Buenos Aires at indoor arena and in different provinces of Argentina like Mendoza, Córdoba, Tucumán, Jujuy and Neuquén. Every location was connected to the others via satellite. Myriam Bregman, Buenos Aires city representative and member of the PTS, was first to speak at the rally and talked about her recent trip to Brazil to participate in the massive march against Bolsonaro alongside the MRT, PTS’s sister organization. She said it baffled her that the main parties tried to conceal the fact that the election was rigged since it came right after an institutional coup against the opposition´s main candidate, Luiz Inácio Lula da Silva. Lula is in jail and denied due process, barred by the right wing judiciary from giving interviews and even from voting. Bregman added that “Brazil shows us that (…) what we don’t win by struggling in the streets makes us weaker in a way that cannot be solved by any electoral strategy”—a clear reference to the fact that the PT (Partido dos Trabalhadores—Worker’s Party) didn’t fight back against the coup. Bregman also denounced the bourgeois parties in Argentina which, alongside the Catholic Church, prevented the abortion legalization from passing in the Senate. “Every bourgeois party has ties to the Church, that’s why only the left really fights for women’s rights”. Raúl Godoy, deputy for Neuquen province and ceramic worker at Zanon, a factory under worker control, spoke from Neuquen. He recounted his first fight at Zanon, for the workers to embrace a revolutionary program in one of the deepest economic crises Argentina has faced. He also explained how that program turned into a vital force once it was adopted—the Zanon workers took over the factory and put it to work, becoming an example for the international working class“There’s a red thread that runs through history, the thread of workers and socialist militancy that fuses with the working class vanguard. 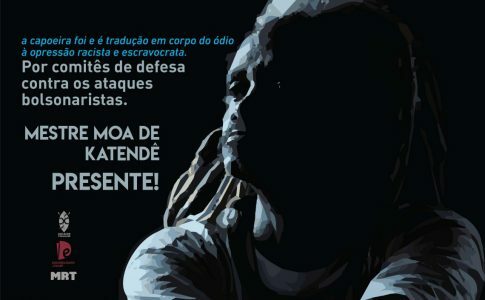 I call you to this task: to militancy, to take our destiny into our own hands”. The rally continued with speakers discussing the current struggles at businesses like Telam, the official news agency of Argentina, Posadas Hospital, the biggest in Buenos Aires province, Rio Santiago shipyard and Rio Turbio coal mine. Alejandro Vilca spoke from Jujuy in the North, Noelia Barbeito spoke from Mendoza in the West, and students spoke from Cordoba and Buenos Aires province. Two members of the FIT, Marcelo Ramal from Partido Obrero and Laura Marrone from Izquierda Socialista, also spoke, sending their greetings to the participants in the massive rally. Nicolás Del Caño, member of Congress for the PTS and the FIT spoke at the end of the rally. He argued that “the capitalist class has declared war on the people and there are two possible outcomes. 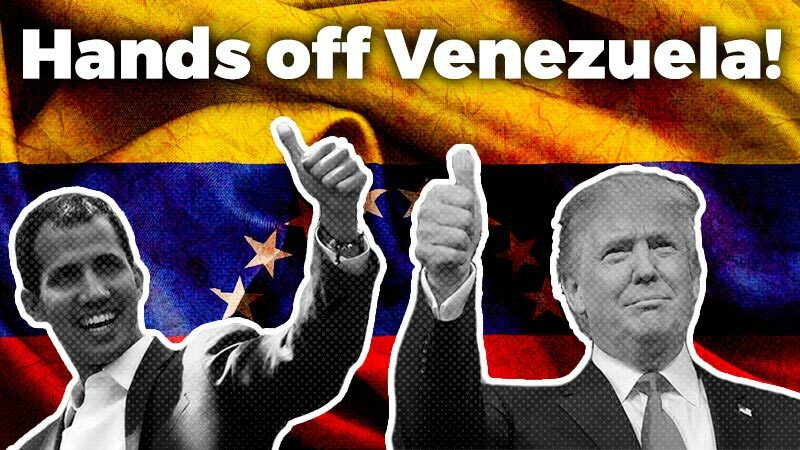 Either this crisis is resolved via a massive new pillage of the working class and the poor, or the capitalists will pay for it. If we wait until the next elections like the Kirchnerists are saying, the IMF will have won.” He then advanced a set of proposals on behalf of the PTS as a Program of Action for the battles to come. The first piece he presented was an emergency plan, starting with a refusal to pay the public debt and the creation of a single state bank, an immediate increase in pensions, a cost-of-living adjustment to the minimum wage, and the distribution of work hours among all workers to avoid unemployment. It also included imposing a state monopoly on foreign trade, and expropriating the landowners who parasitically live off the wealth created by the workers. And echoing Myriam Bregman, Del Caño said “We must fight for a free Constituent Assembly”. 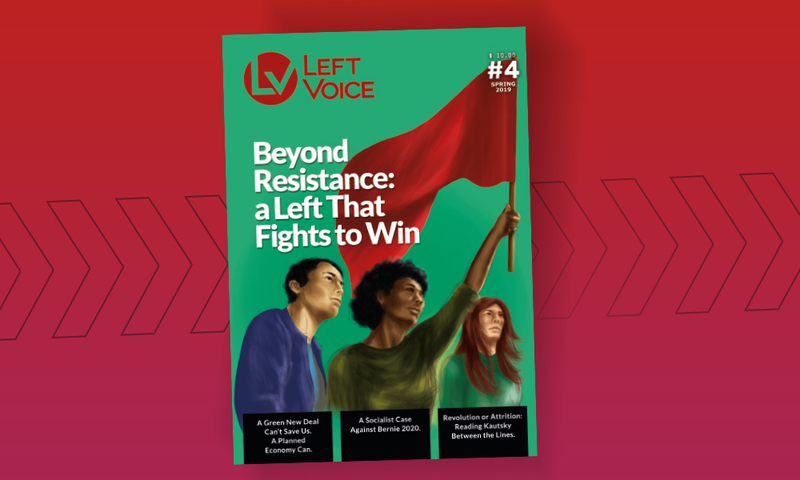 In light of the current scattered resistance to the austerity measures, the second proposal was to build a coalition of student activists, workers, members of the women’s movement and leftists to support every one of these conflicts through solidarity. We are committed to building new forms of coordination among these groups to overcome the obstacles imposed by bureaucratic leadership of the unions. Thus we will be in a better position to impose a plan for a national struggle that will culminate in a general strike, lasting until the defeat of Macri and the IMF. Following the experience of the FIT, during which the parties involved and many independent collaborators advanced in a common experience that cemented the agreements and clarified disagreements, the PTS is making this call based on the same method that built the FIT. As we argued in another article diluting our political program is not the way to reach the masses; this has been illustrated by the failures of Syriza and Podemos. The way forward is to build a strong workers party with a revolutionary program, and this is what the PTS is proposing. This proposal can serve as a strong example for the workers of the world. The peso plummets 30% in two days, President Mauricio Macri announces new austerity measures and popular resistance grows.